Today we can hardly imagine that 65 years ago the victorious Allies were in the process of dismembering Germany, tearing down its economy and starving out its population. 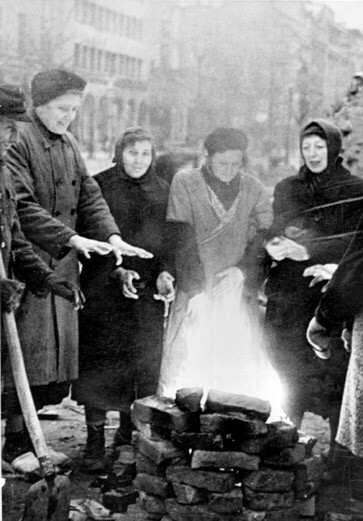 Older Germans remember the postwar winter of 1946/1947 as a dreadful hunger winter. In his book The German Question and the Origins of the Cold War (Milan 2008) Nicolas Lewkowicz notes that “Germany was given the most comprehensive treatment ever dispensed to a vanquished nation in the modern history of the international political system.” (p. 11) The question is how this treatment came to be and which forces played a pivotal role in these developments. In 1942 the war was far from decided as German submarines were cruising the American Eastcoast and German tanks were relentlessly advancing in Russia and Africa. This did not stop (or maybe actually encouraged) Jewish exiles from dreaming about Germany’s demise after the war. Tens of thousands of Jewish exiles from Germany had found refuge in New York and even had their own newspaper —Aufbau (German word for ‘build-up’). They were not sitting idle awaiting the end of hostilities, but were active in canvassing the public opinion to lobby for imposing a hard peace on Germany. The most active and outspoken among them was Emil Cohn, better known under his German pen name Emil Ludwig. Cohn delivered an important speech in New York in 1942, which was noted in the New York Times (6th of July 1942) and printed in Aufbau (July 24th 1942): “Was soll mit Deutschland geschehen?” (What should happen with Germany?). Ludwig advocated that Germany should be totally occupied and not be able to exercise self-government for a long time. Germany should go through a ‘probation’ and should be ‘re-educated’. Another contributor to Aufbau, Manfred George, made no secret about his his primary allegiance when he noted in Aufbau (March 19, 1943) that “onetime German-speaking Jews consider this problem [of Germany’s fate after the war] as Jews and not as Germans.” There were many similar voices but Cohn was not a mere commentator as he was summoned to testify before the Committee on Foreign Affairs of the House of Representatives on March 26 1943. He proposed a partition of Germany and a long period of Allied control. In order to spread his radical ideas among the American public he published a book with the title How To Treat The Germans (New York: Willard, 1943). Note that there is no question mark in the title. In Jewish circles there was little room for a distinction between National-Socialist policies and the German people, which was contrary to the American public opinion of Germany as I will illustrate below. The idea of collective punishment based on collective guilt was paramount among Jews. During a protest rally at Boston Garden on May 2 1943 assistant secretary of state Adolf Augustus Berle Jr. exclaimed: “This guilt now generalized throughout the German people must constitute one of the basic considerations in dealing with the German people in the hour of their final defeat.” Berle was not Jewish, but his family was strongly pro-Zionist and philo-Semitic. His father, Adolf Augustus Berle Sr., was the author of the book The World Significance Of A Jewish State (New York: M. Kennerly, 1918). The World Jewish Congress promoted Berle’s speech at this rally in the Jewish Comment (May 28, 1943). This plan meant that the abandonment of the Anglo-American Atlantic Charter of August 1941, which stipulated that no territorial changes would be made without the consent of the people concerned. Moreover, the plan was highly criticized in the media and did not have any significant support among the American public. A public opinion-poll of June 1943 showed that only 11% of the people in the poll were in favor of carving up Germany (“Germany in the Dock,” Fortune, June 27, 1943). In a poll of September 1943 only a quarter of the American public responded that Germany was inherently warlike (50% thought Japan was inherently warlike). Apparently the American public did not hate (or fear) Germans. In order to achieve this the Society for the Prevention of World War III was found in December 1943. At a first glance non-Jews like the German pacifist Friedrich Wilhelm Foerster and the American fiction writer Rex Stout were in charge, but the advisory committee was stacked with Jews like Paul Winkler, Louis Nizer and Clifton Fadiman. Jews were also overrepresented among the contributors and writers, because they were mustered in Jewish circles (S. Casey (2005), “The campaign to sell a harsh peace for Germany to the American public, 1944–1948,” p. 11) The Society was the vanguard of advocates for Germany’s dismemberment. In 1943 Paul Winkler published a book called The German Conspiracy: Secret Germany Behind the Mask (New York: Charles Scribner’s sons, 1943). In 1944 Louis Nizer published his book What To Do With Germany (Chicago: Ziff-Davis) in which he advocated that Germany’s sovereignty as a nation should be forfeited. The society was not very successful among the public. Indeed, its hatred for the Germans as a nation caused indignation among some writers and editors, who accused the society of “bad history, bad logic, and inverted racism” (Common Sense, June 1944 p. 207–212). The “Morgenthau Plan” has often been downplayed: Morgenthau’s role was diminished by the suggestion that it came largely from the pen of Harry Dexter White (also Jewish, a target of Sen. Joe McCarthy, and later shown to be a communist spy), that the plan was executed after Morgenthau’s term of office, and that the Allied occupation in fact ended in the formation of the Federal Republic of Germany in 1948. However, it should be noted that Morgenthau was committed to the execution of his plan and published a book Germany Is Our Problem (New York: Harper, 1945) to personally promote the plan. The Allied occupation regime until 1948 largely executed the Morgenthau Plan by Joint Chiefs of Staff Directive 1067 imposing a division of Germany into four zones, restrictive food distribution which caused starvation in 1947, and by dismantling German industries. Millions of Germans were submitted to forced labor abroad and millions of Germans were on the brink of starvation at home as pointed out in Herbert Hoover’s report “German Agricultural and Food Requirements.” Eventually, it was the Cold War that hastened the creation of the Federal Republic of Germany and its merging into the camp of the Western Allies. As outlined above, the Roosevelt administration’s postwar plan for Germany did not stem from the sentiment among the American public, or even its generals at the front. The American public did not believe in the inherent evil of the Germans, nor did it desire a harsh peace. They did not hate the Germans, nor did they believe in collective guilt/punishment. It was the desire of small minority of Jewish activists and policy makers with access to President Roosevelt. The Morgenthau Plan did not come out of the blue; its outline was in place long before September 1944. It stemmed from the same group of Jewish activists and policy makers who had advocated its basic principles for years in many publications. Morgenthau himself was deeply committed to his plan and advocated its execution after his leave from office. The Morgenthau Plan became the official Allied occupation policy of Germany until Cold War reality forced its abandonment. Still, it should be noted that at least until 1991 German chancellors were forced to sign a ‘act of submission’ to the Allied victors before entering office.